The MARL Panel Indicator LED product range has evolved significantly since Marl began designing and manufacturing high performance panel lamps in the early 1980s, to reach the point today where they are recognised as the leading global brand. This reputation has been earned from a product which has consistently demonstrated very high orders of reliability, providing a positive indication at front of panel for a vast array of safety critical applications, including those exposed to the harshest of natural and man made environments, in an equally diverse array of professional and industrial markets around the world. At ground level, subterranean level, at depth under fresh and salt water, and 5m, 50m, 500m, and 5km in the air above sea level, design engineers have been choosing Marl Panel Mounting LED Indicators to give end users clear visibility from the best single light source available. 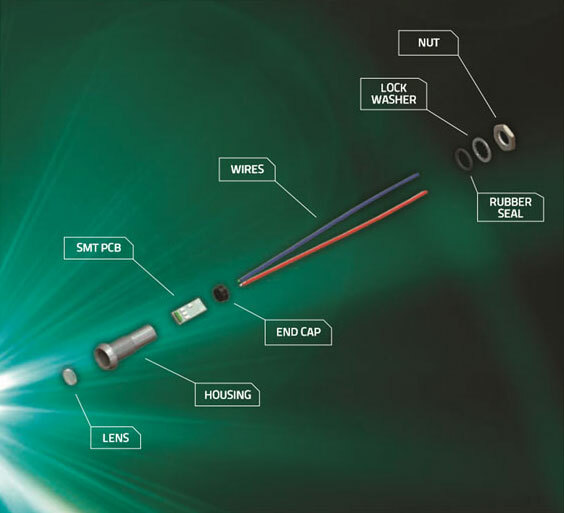 This ultimate range of indicators are available in a wide range of mounting diameters and combine features such as ingress protection (IP67), sunlight readability, with outstanding orders of operational performance and reliability. Other options include internal limiting resistors, test facility, true low voltage DC Bi-Polar termination, burn-in and flame retardant flying leads. High performance Panel Indicator Lamps have been specifically designed for installation in all of categories of climatic and hazardous environments and meet all the criteria expected of a product capable of providing high intensity indication for long durations in the most demanding professional and military applications. Browse the MARL Panel Indicator LEDs range, or contact us for more information.